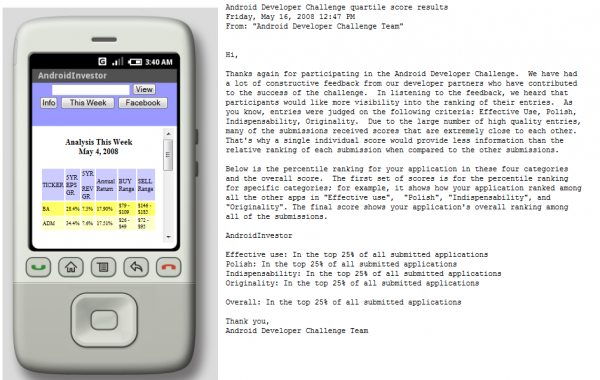 Here is a little background on an App that we did for the first Android Competition. The Android Investor was based on the NAIC® Stock Selection Guide® which is a form designed by the National Association of Investors Corporation to help evaluate potential investments in individual common stocks. It uses fundamental analysis to evaluate potential investments for both growth and value. Here is where you evaluate historical growth trends in revenue (sales), pre-tax profit (PTP) and earnings per share (EPS). For each of these you want to see relatively consistent compound growth. You also want to see all three growing at similar rates. This is also where you make judgment decisions to estimate the potential future sales and EPS values. This potential future EPS value is produced either from an estimated future EPS growth rate or from an estimated future income statement. The later method is referred to as “preferred procedure” (which does not necessarily suggest that it’s always to be “preferred” over the former method. Here is where you evaluate trends in historical pre-tax profit margins (pre-tax profit as a percentage of revenue) and return on equity. For each of these you want to see stability or improvement as well as superiority when compared with other companies in the same industry. Here is where you evaluate the current PE level in the context of historical PE levels. The historical PE levels help establish a “typical” level and range of PE values specific to this stock (sometimes refered to as a “signature PE”). Current PE level is compared with this “typical” level to produce Relative Value (RV), which is the current PE level expressed as a percentage of the typical historical level. The concept of PE (Price divided by Earnings, or PE ratio) is sometimes likened to price-per-pound (or unit pricing) in a grocery store. Unit product pricing allows you to compare the value of the underlying product without regard to the price of that product when packaged in various quantities. PE ratio allows you to compare the “per-pound” price of the underlying “product” (the level of EPS produced by the company) without regard to how the product is packaged (as shares). To determine the value of bananas in the grocery store (regardless of how many bananas you plan to buy) you need to know how much it costs to buy one pound of bananas (price per pound), not how much it costs to buy one banana or one bunch of bananas. To help determine the value of a stock investment you need to know how much it costs to buy one dollar of EPS produced by that company (price per “pound”), not how much is costs to buy one share of the stock. Buying one share of stock is like buying one banana; PE ratio is like the price per pound of the bananas. Here is where you establish a potential future high and low price. These are compared with the current price to estimate both a potential “up-side” (how much the price might go up) and a potential “down-side” (how much the price might go down). US/DS Ratio is the “up-side” as a percentage of the “down-side”, a way or measuring the risk of the investment. Here is where you evaluate the overall potential for gain over five years from investing at the current price. This is done by combining the potential for price appreciation over five years (the “up-side” described earlier) with an estimate of future dividend yield (if any). This overall potential for gain is represented as an annualized five-year rate of growth and is refered to as “Total Return”. The level of Total Return required to double an investment over five years is approximately 15% (14.870%). Total Return (TR) is the measure of overall potential gain traditionally used on the SSG. TR assumes a potential future price based on a future high PE level. Projected Average Return (PAR) is another measure of overall potential gain. PAR assumes a potential future price based on a future average PE level. Both TR and PAR assume the same future high EPS level. The amount of PE expansion assumed to be achievable is greater with TR than with PAR. Disclaimer: This site is for educational purposes only. Please review key statistics before making any stock decisions.